Nicola Anderson was previously on the Everton Ladies coaching staff before becoming interim boss. 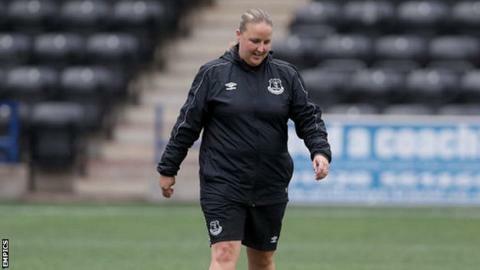 Nicola Anderson is to remain as interim manager of Women's Super League Two side Everton Ladies until the end of the season. Anderson took over the role in June after former boss Andy Spence resigned following his three years in charge. "It's an opportunity that I've relished, really," Anderson told BBC Sport. "I believe in this group of players and for me, it was a no brainer when it was offered to me." Everton are currently fifth in WSL 2, 13 points behind leaders Doncaster Rovers Belles but with two games in hand. Speaking after Thursday's 2-0 Continenal Cup defeat by Liverpool, Anderson would not be drawn on whether she was interested in managing the club on a permanent basis. "I don't really think that at this stage I can really answer the question," she added. "My focus is until the end of the season and looking beyond that is jumping way ahead of ourselves."